I’ve been developing iOS apps since the beginning of time. 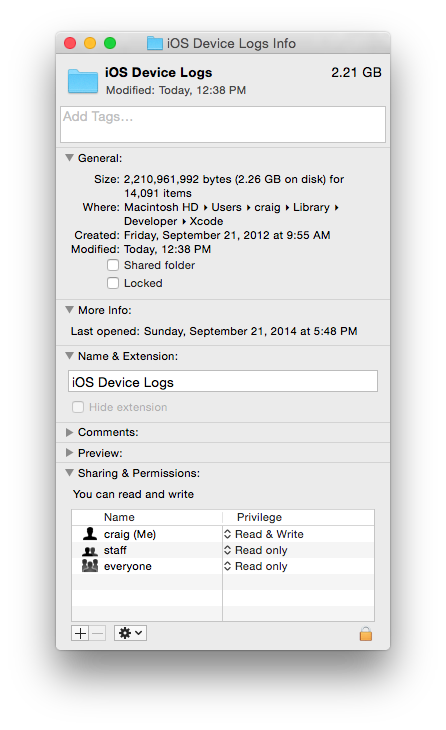 I had over 7,000 crash logs in my ~/Library/Developer/Xcode/iOS Device Logs folder! Every time I opened the new Devices window Xcode would tell me it processing some very old crash logs: at one point I saw one from 2008 go by! All this useless work prevented me from getting to the most recent reports. $ sqlite3 "iOS Device Logs 6.0.1.db"
I first tried removing all the old .crash files. Xcode still insisted on processing, so it must be working on stuff already captured in the SQLite database. When I removed the most recent database, I was greeted with an Xcode hang after clicking on the “View Device Logs” button. A spindump showed that Xcode’s DTDKCrashLogDatabase class was doing a -performBlockAndWait: on the main thread. I’m guessing that Xcode was trying to copy over databases from previous versions as some kind of migration process. In the end, I removed everything in the iOS Device Logs folder and can now use the Devices window as it was intended. Note for Apple folks: A Radar with the spindump is here: rdar://18489861.